This relay board solves all of these problems. It enables you to control twin horns and lighting with only two control wires. It uses properly suppressed relays, minimising the chances of fault currents in the wrong place. It measures approximately 76mm x 60mm. Two relays can operate twin horns via one control wire, operating from a centre-off switch. Earthing the control wire operates one relay/horn, connecting to battery positive operates the second relay/horn. 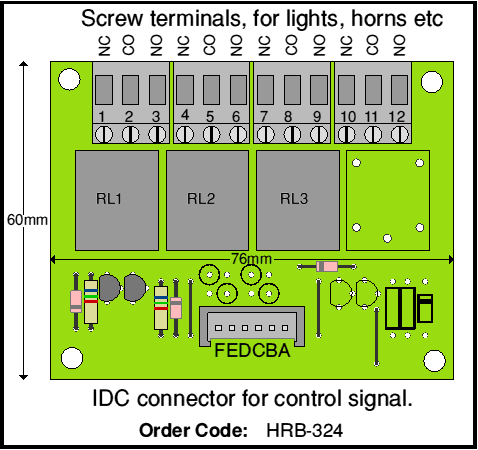 The relay board will greatly simplify the wiring of most miniature locos. A 6 way IDC connector takes the two spare wires from the 8 core control cable, and screw terminals are provided for the horn and lighting wiring. The board is manufactured with a number of “break points” that allow the relays to be isolated for use in many applications. The lighting relay is a single wire operation, but there is space for a fourth relay so that another twin relay system can be implemented. 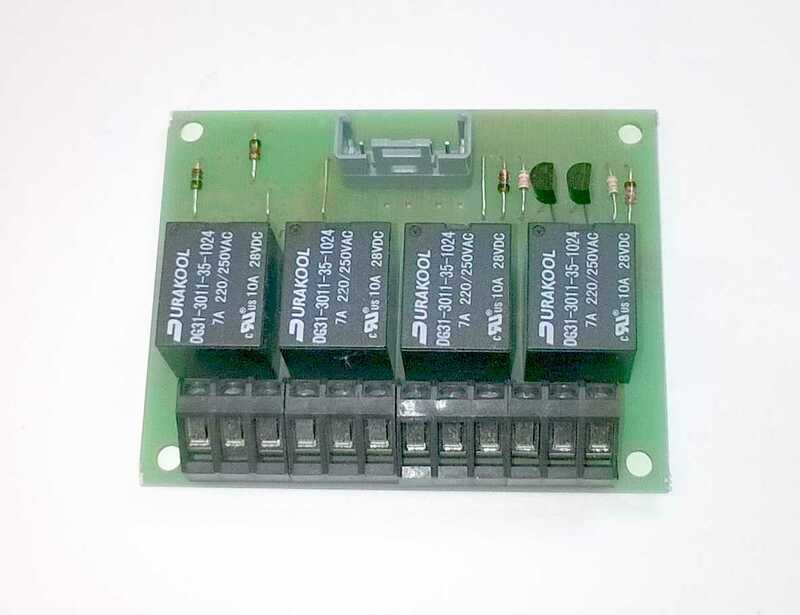 Alternatively the four relays could be worked independently (requiring four control wires). Relay continuous current handling: 10 amps at 24 volts. Versions available with 3 and 4 relays [4th relay usually used for reversing lights]. Versions available for 12 and 24 volt systems.